The April showers at the very end of the month didn’t amount to much in the end, so the ground is still dry, hoping for more soon; great soil conditions for weed control control though! (Update: more rain today, 3/5, yippee! - so more transplanting planned for the weekend). Looking after our baby plants is keeping us busy too; we’ve almost finished seeding next season’s leeks (and almost finished harvesting last season’s!) and have just stated seeding our tender outdoor crops - courgettes, squash and sweetcorn. The ‘Hungry Gap’ is upon us, the time of year when UK grown vegetables are in short supply. Our over-wintered crops are almost finished, just spinach, chard, a small area of leeks and very little kale left in our fields now – the cabbage, sprouts, beetroot, purple sprouting, swede and parsnips are all finished. The only stored crop we have left is a small amount of crown prince squash. 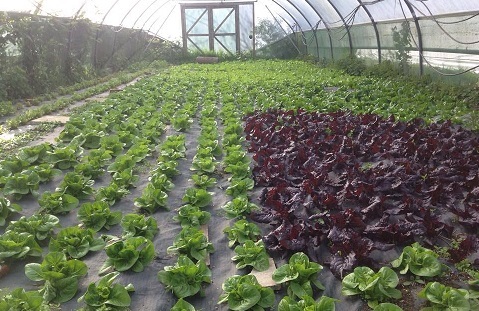 Our new season’s crops so far have been lettuce, salad leaves and parsley from polytunnels. New season’s kale and annual spinach will soon be ready in the fields, as well as spring onions, spring/green garlic and a small area of broad beans. We will be buying in organic mushrooms during April and May to add some variety to the veggie boxes.